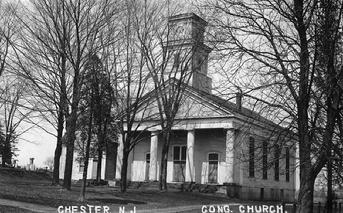 The First Congregational Church of Chester, NJ has the honor and distinction of being the oldest Congregational church west of the Hudson River. The fathers of the Congregational Church in Chester, formerly called Roxbury, were descended from the company of English Puritans who first settled Southhold, L.I. Their fathers left England during the turbulent times in the reign of Charles the First. They fled from tyranny and oppression and were ardently devoted to civil liberty and zealous for the purity and simplicity of the Protestant religion. One of these men was the Rev. John Youngs, who had been a Minister in Kingham, England. In 1640, he came to New Haven, Connecticut with a group from his church. He remained there for a short time and then passed over to Long Island, with his church, and settled upon a tract of land purchased from the Conhony Indians. The tract of land now constituting the township of Chester, was surveyed and run into lots in 1713 and 1714, and began soon after to be settled with emigrants from Southhold, L.I., who had been brought up in the Congregational Church, planted there by their father's and were by conviction and profession attached to its doctrines and customs. These men were not only strong Congregationalists, but were hard working farmers as well. They now had land to be cleared of heavy timber, private buildings to erect, roads and bridges to build and fences to make. Because these early comers were few in number, they joined with the few in Ralston and Mendham and all worshipped together in a log meeting house, which they erected in the Roxiticus area. This log cabin was located on the left side of the hill, at the sharp corner going towards Mendham and was affectionately called "God's Barn." The Congregationalists of Black River became more and more �homesick� for their own doctrines and form of worship, and in 1740 organized the first Congregational church and in 1747 found they were able to erect their own meetinghouse near the center of town. It was a commodious house of worship, with pews and galleries to seat an audience of 400. The furnishings of the church at Roxiticus were given to this new church. Hymns were sung from memory or, because few could read, the leader spoke a line or two, which the congregation sang back. This was called lining out the hymns. �About the time of the building of this first church the excitement which caused the separation in the Congregational Churches of Connecticut and Long Island reached this settlement and a majority of the inhabitants became "Separates," as they were then called. A Separate Congregational Church was gathered which was ministered unto by Rev. Samuel Swayze. He was the first settled pastor. He labored with the church for twenty years and then organized a colony, largely from Chester, and located near Natchez, Mississippi. Soon after arriving in their wilderness home they were regularly organized into a Congregational Church and Mr. Swayze took its pastorate. Of this, Reverend F. A. Johnson writes, "He was beyond doubt the first Protestant minister that ever settled in what is now the state of Mississippi, and his church as the first Protestant Church ever organized there. Therefore the Chester Church may be said to be the Mother of Protestantism and Congregationalism in the great Southwest." This first house of worship in town, stood about twenty rods northwest of their second house of worship, that was erected in the center of the cemetery. The first site of the church was described as across Hillside Road from the cemetery, northwest of the present church, and was used for 63 years. Rev. Samuel Swayze Jr. was the first pastor of this church and installed in 1747 and served for about 25 years. In 1773, he led a group of 72 families from Black River to fourteen miles south of Natchez, MS.
Rev. Samuel Swayze, who was born at Southhold, L.I., in 1689, and removed from that place to Chester in May, 1737. From an old parchment found among the papers of the late W. H. Seward, Secretary of State for Mr. Lincoln, it appears that Mr. Seward's mother was Mary Swayze, the youngest daughter of the above named Rev. Samuel Swayze. This building was used for a house of worship till 1803. Two generations worshipped in it, and many souls were born into the Saviour's Kingdom within its sacred walls. It was remodeled in 1803, and part of its timbers were used in the framework of a barn on the estate of Mr. William Seward at the Chester Cross Roads. Just imagine a Sabath Day in 1776, when your forefathers gathered in this old church. It is doubtful whether a wheeled vehicle drove up to the door. Some came on horseback, but more walked, winding their way for miles through woodland foot-paths. The women often carried their shoes in their hands to save wear and tear, placing them upon their feet as they approached the church. We should think it a strange appearing company which gathered in that meeting house, but there were men and women there who feared God, who God loved as His dear children, who have long since entered the mansion prepared for the lowly as well as the great who truly love and serve Him. Soon after the close of the pastorate of the Rev. Samuel Sweazy at the Black River church, the war of the Revolution began. The years 1777 and '78 were stirring times in New Jersey. Hostile armies crossed and re-crossed the state, desolating its fair villages with fire and sword. Chester was off the line of conflict, and yet must have been a source of supply for the patriot army while encamped at Morristown. During these years worship was suspended and the Congregational Meeting house was used as a hospital for wounded and disabled soldiers. It is to be regretted that the church records do not give a more complete account of the events of this important historical period. Every patriotic impulse is stirred to know more of those scenes that transpired upon this hillside; when in this old church patriots suffered and yielded their lives for the holy cause of freedom. But the entries in the books for those years are very meager. During these exciting times, when worship was suspended, the moral and religious habits of the people suffered greatly. About 1779, a union of the two churches was attempted under the Rev. David Baldwin, who, for six years preached on alternate Sabbaths in the two houses of worship. Failing to accomplish the desired union Mr. Baldwin left his field of labor and soon after the church was pronounced dissolved. But immediately a new congregational Church was organized, and in June 1785, the Rev. James Youngs was ordained and installed as pastor. The ministry of Mr. Youngs was very short. He died in November, 1790, aged 32, deeply lamented by his people and his brethren in the ministry. From 1790 to 1801, the church was without a regular pastor; but ministers from Long Island frequently visited the people, and through their preaching sinners were converted and the church edified. In November, 1800, the church held a day of fasting and prayer for direction in the choice of another pastor. They were led to extended a call to Mr. Stephen Overton, who was ordained and installed pastor on the 16th of June, 1801. The congregation rapidly increased. In 1803 the original house of worship was replaced by another more modern in appearance, 50 feet by 40 in size with front and side galleries, a steeple and bell. Great revivals occurred during Mr. Overton's early ministry, and many substantial members were added to the church; but many, sad to relate, dishonored their profession and returned to the world. From 1817 to 1828 the church and congregation sadly declined in spirituality, and in regard for the prosperity of the church. It was feared that a final dissolution would result from this indifference. Mr. Overton was dismissed from his long pastorate in March, 1828. He died on September 18, 1830. The church records refer to him as possessed of strong intellectual powers with "a clear melodious voice and thrilling elocution, endowed with one of the strongest constitutions; he traveled much, preaching more than once a day for weeks in succession." From its formation till 1810, the church as pastor were enrolled as members of the "Separate Congregational Convention of Connecticut and Long Island." In 1810, with other churches in this State, it formed a new and similar Convention, which in 1828 was dissolved. Let us try to picture a Sabbath in this second house of worship in 1826. Since 1776 there have been many improvements, yet even now nothing we would call a carriage approaches the door. Many of the congregation still come on horseback, others walk, while now and then a rude wagon deposits its load at the door. As we enter the door everything seems very strange to us in 1876. The pulpit is so high that necks are fearfully wrenched in efforts to see the preacher. A row of box pews with high backs, facing toward the center of the church, extends along the wall, and several rows of pews of like pattern occupy the space directly in front of the pulpit. The remainder of the house is filled with ordinary seats. If it be a winter's day, we shall find no fire, and will wonder why these people make such a sacrifice of comfort to hear the gospel; when, in our day, a slight fall of the thermometer would keep half the congregation home from a comfortably warmed church. The congregation is dressed with severe simplicity, and gives token of a sturdy and hard-working race. In the Autumn of 1828, the Rev. Abner Morse was called to the care of the church as acting pastor for three years. he found its spiritual life at a very low ebb. It was resolved that it would not be right to commune at the Lord's table till the church had purged itself of a large number of neglectful and immoral persons. A meeting was called for those only who still considered themselves the cordial friends of Christ, and who were ready to renew their covenant with Him. Some fifty persons responded to this call. While under the pastoral care of Mr. Morse, the church was prospered and its membership largely increased. Mr. Morse was dismissed at his own request in the Spring of 1833. It is probable that the first Protestant church in the lower Mississippi valley was Congregational. it was organized by Rev. Samuel Swayze, in 1773, at Kingston, Mississippi. He was one of the original owners and settlers of the famous "Mandamus Grant," made by George III of Great Britain, to Capt. Ogden, May 13, 1767. Ogden, finding himself unable to comply with the conditions of the grant, sold 19,800 acres of it to Richard and Samuel Swayze, of Morris County, New Jersey, on condition that they would settle their proportion of the families, and pay twenty cents per acre for their purchase, and furthermore assist Ogden to locate the land. Samuel Swayze was a Congregational minister, and had served as a pastor thirty or forty years of his life. In the spring of 1772, Ogden and the two Swayzes came in person to what was then known as the Natchez District, and located their land on the Homochitto river, in what is now the southeast portion of Adams County, Miss. The following autumn the two Swayzes chartered a schooner, and with their families and a few of their co-religionists, sailed from Perth Amboy to Pensacola, Florida. Then embarking in open boats with their effects, they made their way amid perils and difficulties to their new home, arriving in time to plant corn, in the spring of 1773. Most of those settlers were members of Rev. Samuel Swayze's church in New Jersey. Soon after their arrival in their wilderness home they were regularly organized into a Congregational church, and Mr. Swayze took its pastorate. he was beyond doubt the first Protestant minister that ever settled in what is now the State of Mississippi, and his church was the first Protestant church ever organized there. This little flock had to endure many hardships, privations and dangers - one of the most appalling, the stealthy and repeated incursions of hostile Indians. Several of the settlers were killed by them, among whom was Mr. Corey, a grandson of Mr. Swayze. These trouble had not abated, when in 1779, the British government over the Province of New Florida was superceded by that of Spain, and Romanism was declared by law the only religion of the land. The voice and hand of persecution were soon raised against the little church at Kingston, and their religious privileges were greatly abridged. Diligent search was made for Protestant bibles and religious books, and whenever they fell into the hands of the priests or their emissaries, they were committed to the flames. The aged pastor, in order the secure his Bible from destruction, retired to a cane-brake on the border of a small stream, and fixed a seat in the hollow of a large sycamore tree, where he often sat to read the Holy book, and where he kept it concealed. The stream still bears the name of "Sammie's creek," in memory of this patriarchal minister. Regular public worship had to be abandoned, and only an incidental sermon was preached when it could be done with safety. An agreement was made between the aged minister and the church-going people that when there was no apparent danger, a person designated was to pass through the settlements on Sabbath morning and blow a cow's-horn, as a hunter would do to control his dogs. This was the signal for public worship. The people went timidly and stealthily to the house of prayer, with the understanding that if any suspicious persons were reported as being in the vicinity, they were to disperse immediately. In 1780, hostile Indians drove the settlers from the "Mandamus Grant," and they removed temporarily to St. Catharine's creek, near Natchez, where Rev. Samuel Swayze and his wife died, in 1784, and were buried just below old Fort Rosalie. A son of the deceased pastor, "who was gifted in public prayer and exhortation," but who was never ordained, perhaps not even regularly licensed to preach, then took oversight of the church, "hoping that a regular pastor might be obtained before long;" but he did not long survive his father, so the little flock was left as "sheep without a shepherd" in the wilderness, and was never again organized as a Congregational church, but was eventually absorbed by other denominations which organized churches in the vicinity. Rev. John G. Jones, a descendant of Rev. Samuel Swayze, in his "Reminiscences of the Southwest," enumerates almost a score of names of minister of the Gospel, honored and beloved by the churches of Christ, who proudly claimed to be descendants of the early Puritans of the "Jersey settlement." So began and ended the first congregational church in the Southwest. The present building (there have been two others, the second one built in 1803) was erected in 1856 for $5,000, a small sum in comparison with the construction costs of today. The chandelier was a gift from the First Congregational Church of Newark. Before 1799, Black River was still part of Roxbury, but decided to break away and formed Chester Township. In 1803, the Congregationalists replaced their original house of worship with a new church (2nd building), which was built in an area which is now in the center of the cemetery and was described as more modern in appearance, fifty feet long by forty feet, with front and side galleries, a steeple and a bell (first bell in the area!). Then in 1856 a meeting was held to determine by vote where a new church building (present church) should be erected. In 1876 it was decided that for Sabbath School and for weekly meetings, a Chapel needed to be built. The total cost for the Chapel was $1,098.21! The interior of the First Congregational Church is one of perhaps two remaining examples of �trompe l�oeil� decoration in the state. The beautiful decorating was restored in 1986 by M. A. Murdolo. This design was found under many layers of other designs, by the artist who was preparing the walls for redecoration many years ago. It was by far the most beautiful he had seen and that it must have been the original design that you see today. The detail and the design, especially in the ceiling, have amazed many. The decorated tracker organ (Opus 128), built by J. H. and C. S. Odell in 1873 is used for regular services and was recently restored in 2004 by Meloni & Farrier Organ builders of Port Chester, New York. Its original cost, including freight was about $1,800 and according to the builders who repair our organ, there is only one other like it in operation today. They say it is almost priceless today! The �horse sheds� or carriage houses behind the church are probably the only remaining ones associated with a church, this side of the Mississippi. The sanctuary building is listed on the National Register of Historic Places. Many periods of �renovating� have taken place since 1856, but by and large, the building remains the same to the eye. The installation of electricity has made the most notable change. The kerosene lamps that once hung from the ceiling are gone, as are those that were in the chandelier and those that lighted the organ. The iron �eye� into which the hanger for the lamps was placed, is still in the organ. The once hand-pumped pipe organ has been electrified. The Pulpit appointments and Communion Table were installed in the 1880s. The interior of the First Congregational Church is one of perhaps two remaining examples of “trompe l’oeil” decoration in the state. The beautiful decorating was restored in 1986 by M. A. Murdolo. The decorated tracker organ (Opus 128), built by J. H. and C. S. Odell in 1873 is used for regular services and was recently restored in 2004 by Meloni & Farrier Organbuilders of Port Chester, New York. These are the historic horse sheds used at the Congregational Church when people rode in their wagons and carriages to church. These are some of the only remaining horse sheds left on church property, in the area. Click on the image to enlarge them. Many of the old stones in the cemetery are getting harder and harder to read. Pictured in the top photo and totally unreadable, are the stones for General Samuel Swayze, Sr. and his wife, Penelope. We believe that the second church had been built in the middle of this cemetery, as there is a large open space, without any stones there. "The Jersey Settler Family Names"
The original Jersey Settler families were members of Rev. Samuel Swayze's Congregational church in Chester, New Jersey, along with the family of Capt. Amos Ogden, original grantee of the mandamus in West Florida, now Mississippi. Other neighboring families, either in the area when the Jersey Settlers arrived or shortly thereafter, became over the years closely allied to the Jersey Settlers, usually through marriages, and are considered as important to our organization as the original Jersey Settlers.